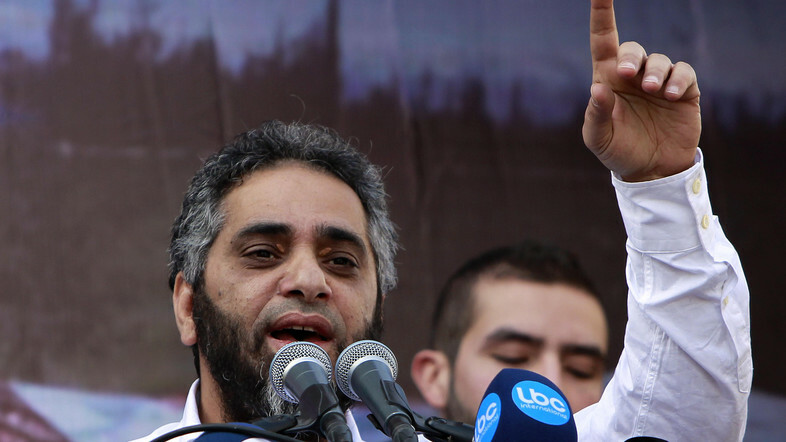 The sentence was given in absentia, as Shaker has not been arrested yet despite living in a Palestinian camp in Lebanon. The singer was on trial along with 32 others, including his former Salafi sheikh Ahmed al-Asir. The latter was sentenced to death. “The one who blew the mosques of Tripoli is free, but that who stood in the face of Bashar and told him ‘enough’ was sentenced to 15 years of rigorous imprisonment unfairly! Thank you for your justice,” Shaker wrote on his Twitter account commenting on the court verdict. والذي فجر مساجد طرابلس حر طليق ..
لكن من وقف بوجه بشار وقال كفى , يتم حكمه ظلماً 15 عاماً , مع الأعمال الشاقة ! “The one who cooperated with the Israeli occupation was sentenced only to two years in prison, whereas no one dared to try or arrest the one who killed Rafiq al-Hariri,” he added. Shaker denies being involved with the killing of the soldiers. In 2015 he gave a video interview to a local Lebanese TV channel denying he took part in clashes against the army. His denial goes against what he said in 2013 in a video following the clashes with the Lebanese army. In the video Fadel Shaker says he killed two soldiers and injured four others.